This custom QR code business card maker will instantly generate printable business cards complete with your information and a QR code containing data of your choice. Enter your information and select what you would like have in the QR code. If the information you wish to use in the QR code exceeds our recommanded maximum number of characters, the resulting QR code may not be readable. 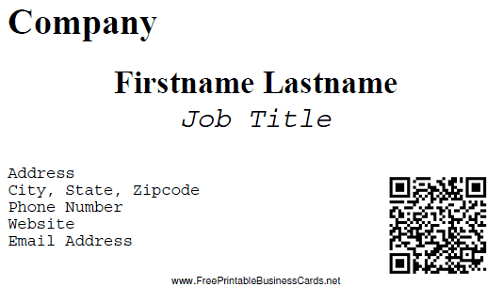 The custom business cards are available in .PDF format. Just submit your information, download, open it in Adobe Reader, and print.